A drop in water pressure, whether sudden or gradual, can make everyday life miserable. Many people do not know the reasons for a loss of water pressure. Unscrupulous plumbers will sometimes charge a homeowner for unnecessary repairs. Before it happens to you, take the time to become familiar with five of the primary reasons for a drop in household water pressure. This knowledge will ultimately save you money and unnecessary inconvenience. Check five basics if your home's water pressure drops. Before trying anything else, conduct a quick inspection of the water shut-off valves for your house. All valves should be in the full, open position. Most valve handles in the open position run parallel with the pipe. A valve in an angled or cross-position relative to the pipe will restrict water flow. Most homes have a main shut-off valve inside the house or garage. Check near the water meter for the other valve location. 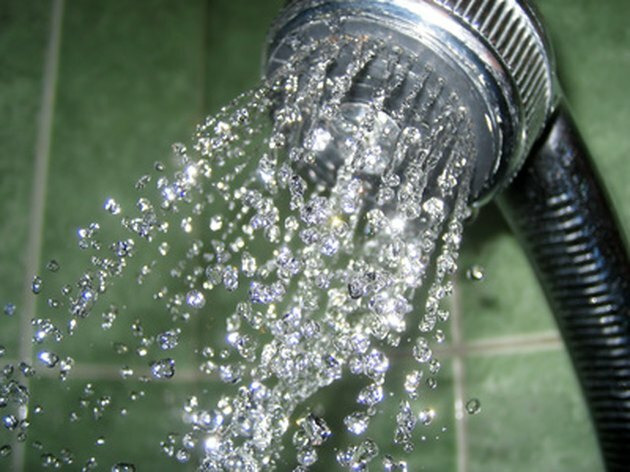 A gradual decrease in water pressure might indicate a mineral buildup in showerheads or faucet aerators. If you notice a crusty off-white mineral buildup, try one of these cleaning methods. Remove the showerhead or aerator and remove the mineral deposits with a toothbrush dipped in white vinegar or products similar to CLR designed to remove calcium. If minor cleaning does not remedy the water pressure drop, the problem could be extensive mineral or rust buildup in old galvanized pipes within the house. If everything appears normal in the first two areas, it may indicate a problem with the main water line. The section of pipe leading from your house to the street could be damaged or obstructed. Homes in new neighborhoods can suffer unintentional water line damage from construction materials and equipment. Invading tree roots can block or damage water lines in older, established neighborhoods. One of the worst-case scenarios deals with an interior pipe leak causing, at some point, a drop in water pressure and damage to the structure. A read of your water meter will confirm a hidden leak. Begin by turning off all interior and exterior water taps then taking an initial water meter reading before leaving for work in the morning. Upon return, check the meter again. If the usage has increased, there is a good possibility your home has a hidden leak. As a last resort, blame it on the water meter. It is very unlikely the meter will cause a drop in water pressure unless significant blockage exists within the unit itself. If you have checked every other option and suspect a water meter problem, call your water provider. They will perform a bypass test to detect internal obstructions or a malfunction.